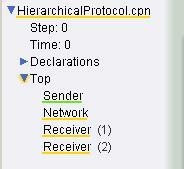 Errors can occur if any of the Hierarchy tools are applied while portions of a net are being syntax checked. It is highly recommended that you do not apply hierarchy tools while there are any yellow highlights on places, arcs, transitions, pages, or net names. Similar problems can occur if hierarchical constructions are cloned during syntax checking. Therefore, it is highly recommended that you do not clone hierarchical constructions during syntax checking. Providing simultaneous support for both incremental syntax checking and construction of hierarchical nets is quite complicated. while you are constructing hierarchical nets, it is highly recommended that you try to fix any obvious errors, such as unassigned ports or missing color set inscriptions, then save the net, and then reload the net. Such error messages almost always disappear after the net has been reloaded.